Public discourse in economics is often rife with ideologies. In a refreshing change, Dani Rodrik et al. outlined a framework called 'Growth Diagnostics’ (GD) to analyze economy, stripping ideology out of analyses. Growth Diagnostics (GD) is simple, elegant and built on first principles. For instance, consider the problem of ‘low private investments’. Following GD framework, it can be analyzed as follows. If low private investment is the problem, what could be the problem? Low return to economic activity or High cost of finance? If it’s high cost of finance, is it due to bad international finance or bad local finance and so on. Such systematic analysis would help identify binding constraints in the economy that can be focused up on. Several improvisations, critiques and limitations followed the popularization of GD approach. Avinash Dixit argued for a better way to determine binding constraints. Dani Rodrik outlined some principles to do GD well. An ADB working paper discussed difficulties in doing GD. Overall, all the literature that followed GD focused either on appropriate method to identify binding constraints or difficulties in identifying binding constraints. Much less has been written about elements of economy (their corresponding binding constraints) that can’t be detected with the current GD approach. Taking forward the discussion on GD, I posit that GD focuses on visible external components of the system. Hence, an important underlying element called state capacity goes out of its radar. The discussion below defines state capacity, its role in GD framework, implications of glossing over state capacity. Finally, I outline some thumb rules to detect state capacity failures, integrating it into the GD framework. State Capacity is the capacity of the state to design and implement policies. It’s the equivalent of invisible hand of the GD tree that makes the individual elements work. GD identifies the binding constraint but easing the constraint requires state capacity. GD identifies binding constraints that can then be first order priorities for the governments. The presumption is that there is a gap in identifying constraints identifying which addresses the problem. What if the problem is much more than that? What if the constraint is implementing policies to ease binding constraints and not necessarily the knowledge of binding constraints? In other words, what if the constraints are already known but the government couldn’t address them? State Capacity comes into picture here. GD focuses on individual components of economy to identify binding constraints. State Capacity can then be seen as the invisible element underlying the GD tree. An analogy would help here. True to its name, GD is similar to a medical diagnostics diagnosing each and every organ of the body. It’s useful in cases where the problem is with the individual elements of the body. The State Capacity is like the soul of the body, which makes the individual organs function. The dysfunctionality of a motion less body, lacking a soul can’t be thus identified using a regular diagnostics approach. The implications of not distinguishing the source of constraints in individual organs of the body and the soul are evident. If the reason for a dysfunctional body is identified in the individual organs, the treatment that follows would be to treat that individual element. If the reason is identified as lack of soul, the approach to reform would be difficult. Fortunately, unlike medical science where the lack of soul doesn’t have a treatment, it’s not the case in economics. Similarly, the cause for an ailing economy can be in the individual elements of the GD tree or in its underlying element, the state capacity. The question thus is — how to determine if the binding constraint lies in the individual elements of the GD tree or its underlying element, the state capacity. The following thumb rules can help in disentangling this. Our ‘organ failure vs. soul less body’ analogy is useful here. III. Thumb rules to determine the location of binding constraint: Individual elements of GD tree OR State Capacity? 1. Many elements seem as binding constraints: Following our organ failure vs. soul less body analogy; in a soul less body, diagnosis shows failure of multiple organs. In our context, in a context with weak state capacity as the binding constraint, GD approach comes across multiple binding constraints. Prevalence of multiple such binding constraints is a symptom of weak state capacity. 2. History of non-improvement of metrics on addressing seemingly binding constraints: Identifying organ failure in a soul less body as the binding constraint and carrying out organ transplant to address it will take us to square one. History of failure of multiple such attempts is a symptom of lack of soul. Similarly, a history of working on easing multiple such seemingly binding constraints but without end result is an indication of weak state capacity. 3. History of failures in easing binding constraints: The second thumb rule (above) talked about binding constraints that are eased but still didn’t yield results. What if there are cases where binding constraints are identified but couldn’t be eased in first place? History of failures to ease binding constraints is again a symptom of challenges in addressing binding constraints and thus an indicator of weak state capacity. 4. History of failures in addressing implementation intensive binding constraints: Lant Pritchett provides a useful framework to think of governments’ functions. He categorized governments’ functions based on the ‘implementation intensity’ and ‘discretion of front line workers’. Decision of a bank rate cut is less implementation intensive and it can be taken by few people sitting in a discussion room. Delivering postal letters is implementation intensive but the front line worker doesn’t need to exercise discretion while performing duty. On the other hand, education, health care, policing are implementation intensive and also require front line workers to exercise discretion. Reforms of this category are difficult and are a test of state capacity. Applying this to our context — weak state capacity by definition means that the state doesn’t have capacity to implement. It should thus follow that the state fails in addressing binding constraints that are implementation intensive. History of failures in easing implementation intensive binding constrains is indicator of weak state capacity as the binding constraint. 5. History of failures in addressing binding constraints where there are multiple competing ways to address it: Let me take a non macro-economics example to illustrate the argument. Consider teacher training. One may identify teacher training as a binding constraint. However, there are multiple ways of training teachers. Achieving results requires iterative adaptation to figure out the right approach, which is an implementation intensive approach. Weak State Capacity can lead to failures in easing binding constraints that have multiple probable ways to address the constraints. The above discussion also sheds light on the nature of GD analyses that glosses over invisible elements like state capacity. Many decisions regarding macro economy aren’t implementation intensive. Significant number of macroeconomic policies are related to removing rules or making a new law that don’t require implementation per se. For instance, increasing bank rates, easing capital flows, removing and imposing tariffs etc. Hence, it’s easy to miss out contexts that are implementation intensive. Addition of state capacity element to the GD framework has implications for analyzing economies at different stages of development. In contexts where there is already a reasonably strong state capacity (developed countries), need of the hour is to identify appropriate constraint. One needn’t worry about its follow through. It must be noted that having a strong state capacity in itself may not be a guarantee for growth. It should be complemented with appropriate policies (implemented using state capacity). GD framework is useful in identifying and prioritizing the policies by identifying suitable binding constraints. It’s a different case in contexts with weak state capacity. In such contexts, the traditional GD framework is useful in addressing problems that are solvable through non-implementation intensive reforms. One might to have to exercise caution about the utility of GD for the rest policies that are implementation intensive. The binding constraint in such cases is the ability to implement and not necessarily identifying the right binding constraint. The ability to implement is a common denominator to multiple policies and thus multiple constraints. 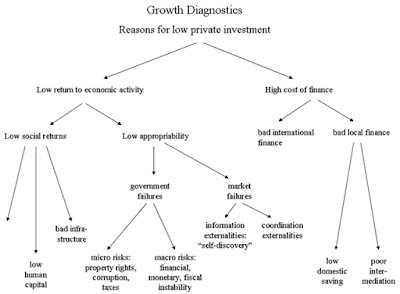 The Growth Diagnostics approach is a refreshing change in approach to analyze economy as it strips off ideology from the analysis. The literature that followed GD focused mostly on appropriate way to identify binding constraints and difficulties in identifying binding constraints. The discussion above takes this discussion forward and argues that some binding constraints are out of GD’s radar. It outlines the importance of state capacity, the implications of its existence as a binding constraint, the difficulty in identifying it using current GD approach. It then presents five thumb rules to disentangle the problem — Is the binding constraint with an individual element of the GD tree or is it due to the weak state capacity. It finally presents possible reasons for glossing over of invisible elements of GD and its importance in developing countries. We discussed an invisible element called weak state capacity and added it to the growth diagnostics framework. For further exploration, it’s useful to think of another invisible binding constraint — political will. Is the problem with a particular element of economy or is the will to address the problem?